As expected, tens of thousands of Egyptians rallied in protests for and against deposed President Mohamed Morsi on Friday, more than two weeks after he was overthrown by the military. Morsi supporters marched throughout Cairo, near the main sit-in at the Rabaa El-Adewaya mosque. 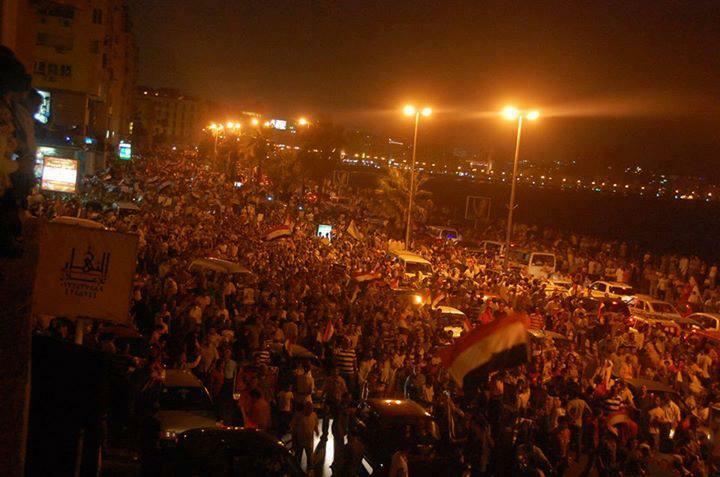 Tens of thousands also gathered in Egypt’s second city Alexandria. Meanwhile, opponents of Morsi protested in Cairo’s Tahrir Square and in front of the Ittihadiya Presidential Palace. In the Nile Delta city of Mansoura, three people — including two bystanders, a woman and child –– were killed late Friday night during clashes between supporters and opponents of Morsi. Seven were injured amid reports of the use of live ammunition, birdshot. and knives. Police fired water cannon on Saturday to disperse hundreds of protesters trying to march to Istanbul’s Gezi Park, the catalyst for nation-wide demonstrations last month against the Erdogan Government. Saturday’s protests were sparked when police blocked access to the park where a couple, who met during last month’s anti-government rallies, were planning to get married after posting an on-line invitation for guests to attend. Groups of riot police chased protesters down side streets leading away from near-by Taksim Square. At least 28 people were killed in five car bombings in predominantly Shi’ite districts of Baghdad on Saturday. The deadliest explosion killed 10 people in the northern neighborhood of Tobchi, when a bomb exploded in car parked in a busy commercial street. Four people were killed in a bombing in a commercial street in the Karrada district. More than 535 people have been killed in attacks in July, according to Iraq Body Count. Egyptian security forces raided the offices of Iran’s Arabic-language satellite channel Al-Alam in Cairo, detaining its director, on Saturday. “The security forces also seized equipment and devices from the channel without giving any explanation for these actions,” Al Alam said on its website. A security source said thechannel lacked a license. Israel’s Minister of Strategic Affairs Yuval Steinitz said on Saturday that West Jerusaleme is prepared to release some “heavyweight” Palestinian prisoners as part of a resumption of peace talks, but cannot accept Palestinian demands over borders. US Secretary of State John Kerry said on Friday that Washington might broker talks between Israel and Palestinian negotiators from next week. The Guardian reports on the economic impact on Gaza after Egypt closed hundreds of smuggling tunnels into the Strip. At the height of the black market, more than 1,000 tunnels employed around 7,000 people and provided about 40% of the Hamas Government’s revenue from taxes and permits. “The Gaza Strip has lost around $225m during the past month due to the halt of imports, namely fuel and crude materials for construction, such as cement, gravel and steel,” said the Hamas Minister of Economy Alaa al-Rafati. About 20,000 construction workers in Gaza have been laid off as a result of the shortage of materials. Israel, which controls the import of goods into Gaza, until recently forbade the passage of construction materials, apart from small quantities for United Nations projects. Fuel is also in short supply, with Hamas introducing rationing to give priority to hospitals, power plants, and water facilities. The Ministry of Health reported that hospitals’ fuel reserves had sunk to 20% last week. The British Government announced on Friday that it is revoking export licenses for equipment used by Egypt’s military and police amid concerns the material could be used against protesters. The licenses cover components for armrred personnel carriers and for machine guns, as well as radio and communications equipment, including for tanks.